VIKEA, by Viking Ruler. Unraced. This is her first foal. Almost Court. Winner at 1400m in 2015-16, 2d CJC Blue Star Taxis H.
Sweet Bucks. Winner at 1600m in 2015-16, 3d Ipswich TC XXXX Good as Gold P.
Betican. Winner at 1350m, BRC Bollinger P., 3d BRC Treasury Wines Estates H.
Revelstoke. 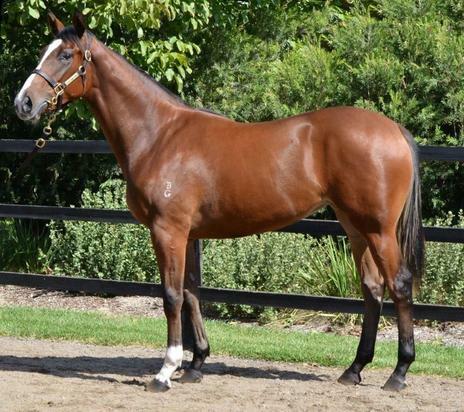 Winner at 2300m in NZ. CINDER BELLA (Victory Dance). 12 wins. See above. Never Back Down. 5 wins from 1400m to 1600m, A$186,795, to 2016-17, ATC TAB Quaddie H., Tab.com.au H., Bowermans Furniture H., All Too Hard at Vinery H., 2d ATC Theraces H., TAB Rewards H., 3d ATC Testa Rossa at Vinery P., Tab.com.au H., TAB Place Multi H., Hyland Race Colours H., McGrath Estate Agents H., TAB Early Quaddie H.
Stormpastthepost - Winning Speed (H.K.). 3 wins at 1400m, 1600m, Manawatu RC Ashhurst Business Houses H., 2d HKJC Panasonic Workio H.
True Courage. 2 wins at 1000m, 1200m, HKJC Shum Shui Po H., Tsap Tseung H., 2d HKJC Gladiolus H., Cleveland H., 3d HKJC Queen's Road East H.
Proclaimer. Winner at 2000m, 2d NSW Tatt's RC Zephyr Bay H.
St Henri. Winner at 1100m in 2015-16 in Aust. Tribesman. 6 wins from 1300m to 3200m, R260,962, Arlington Glenlair Trophy, 4th Turffontein Home Guard H., L.
Citadel. 4 wins from 1200m to 1600m, HKJC Wellington H., Chek Lap Kok H., Purves Quaich H., Ellerslie H., 2d HKJC Panasonic Gaoo H., 3d HKJC Cox's H., Inch Arran H.
DUTCHY'S LASS (Dutch Harry). 3 wins-2 at 2-at 1000m, 1200m, A$146,288, MVRC William Crockett S., L, Moonee Valley Saves Water 2YO H., MRC Wood Court Inn 2YO P., 2d MVRC Moreton Hire 2YO P., 3d VRC Western Health Sponsors 2YO P., 4th MVRC Red Anchor S., Gr.3. Producer. Star of Lanka. Winner at 1400m, STC Dahlia H.